Black Tent Research: Finally did the doctorate! Since winter 2011 there was not much to read about the project and me. Well yes, our two wonderful children came along and there was much to do for being a good mother. Now, that the tiny ones have become bigger, I am quite back from maternity leave and guess what happened? I finished my doctoral thesis (while being a good mother, that is) ! 566 pages heavy and filled with tons of information and insights about Yörük black tents. 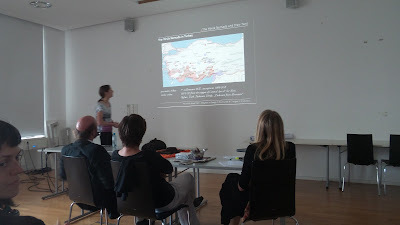 Any scientist interested, search for "The Yoruk Black Tent - Adaption in Design in the Course of Changes in Production" by Kristina Pfeifer at the "Technische Universität Wien". The final doctoral viva was wonderful! I did not only finish with honors, my husband and my children were there, as well! And I got interrogated by 3 wonderful professors who had the most magnificient questions to the subject. I really do like a good discussion and am therefore happy to receive stunning questions and detail remarks. Yes, and I did get married in case you noticed the change of names. We had a wonderful wedding years ago!